Since 2006 we've been translating documents for businesses, charities and individuals and getting our clients the best quality translations, lowest cost and on-time deadlines, from Sworn translations to pharmaceutical translations for Biotech and Health Outcomes companies. We're passionate about everything translation and translate 7 days a week. Get an instant online price to the right. You are not going to be taken to another page! It will give you the price without typing an email address. Our approach is to provide a professional translation service through qualified translators to individuals, small companies, multinational organizations and government agencies. The vast majority of our translators hold the diploma in translation (diptrans) from the Chartered Institute of Linguists or its national equivalent and have made their careers and professions out of translating. Exigo translations was originally established in Barcelona in 2006 and soon relocated to Oxford to concentrate on our key UK market. Although relatively new as a company we are not new to the industry with over 100,000 words translated per translator, and bilingual staff with over 5 years experience in the industry in UK and abroad. Once proof-reading has finished, we can normally translate 2000 words a day of General text and 1500 words a day of Technical text. We will always be honest about the time it will take to deliver a quality translation as this cannot be rushed. We offer a complete localisation service, editing the website directly, adding language bars and changing page and language links. 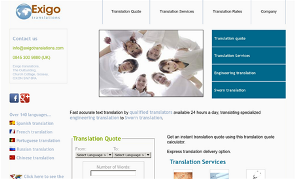 We are one of the few in translation to give an instant price using the online calculator. We can offer prices as low as £0.09 per word including proof-reading and the format you want (eg: websites, from pdf files). Our founding aim is to provide translations that are of such a standard that they appear original, translating meaning rather than just words. We translate into 140 official languages worldwide, translating in specialised fields, ranging from medicine to engineering. Exigo translations is based in UK using qualified translators from around Europe and the world. We use translators that we know personally (many of whom have gone through translator training courses, ie: IoL diploma in translation) from ih Barcelona (www.ihes.com/bcn/translation). To provide competitive quotes and thereby lower costs on translations we are web based so as not to incur large unnecessary overheads. From humble beginnings based in Barcelona. We soon moved to Oxford to concentrate on our UK market, especially the pharmaceutical industry with the multitude of science parks springing up around Oxford. We outgrew our Oxford offices and opened a new office in Colchester, Essex to deal with the growth of the translation business.